If you are looking around for a tool which has the ability to create a signal for stimulation or testing, repair or diagnose an application or if you want to characterize your Logic Circuit, Operational Amplifier, I/Q Modulator etc. or If you want to calculate parameters like bandwidth, phase shift, gain, overshoot, slew rate performance, frequency response of various electronic equipment, then just buy a Arbitrary Function Generator (or Arbitrary Waveform Generator) from us. We are the only Arbitrary Function Generator Manufacturer which includes bountiful features in its device. Also, we manufacture an instrument which is easy to use and which won’t occupy much room on your table. An Arbitrary Function Generator or an Arbitrary Waveform Generator has many applications like Embedded and Semiconductor Test Applications, RF Related Applications, Automotive Applications, Education-Related Applications, Medical Applications, Industrial Applications and Research Applications. 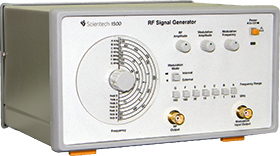 Thus, Scientech Technologies has its customers from all disciplines and areas and thus it makes Scientech one of the biggest arbitrary function generator supplier. An Arbitrary Function Generator or an Arbitrary Waveform Generator (it uses Direct Digital Synthesis technique to generate wave forms) is the most versatile test equipment which is used to generate all the possible varieties of waveform which are used for various kinds of applications. To obtain electrical Wave forms like sine, triangular, square and saw tooth shaped, a function generator is the most classic tool available. Also, these wave forms can be generated over a wide range of frequencies. An arbitrary waveform generator also has the ability to switch between different frequencies instantly. 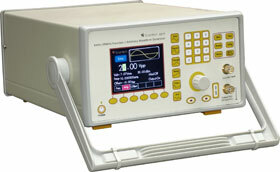 A function generator is also capable of displaying the captured signal through an Oscilloscope. The strength of an arbitrary waveform generator is in its ability to produce the most stable as well as accurate waveform in standard shapes. You can also design your own signal and generate it using the arbitrary waveform generator. Moreover, it offers you to modulate a signal from internal or external source generate frequency sweeps or output signal bursts. Arbitrary function generator is also able to generate Ideal signals for industry standards with specific tolerances. Also, the capability of phase locking is a specialty of function generator. Using a function generator has some benefits like it has dual channels that can operate with independent timing and operating mode.